The 1960s were a time of love and freedom, there not often renowned for their premium online slot games but this 5 reel casino slots online game sure does pave the way. Discover your peace through 5 reels of psychedelia and free spin bonus in this 60s slot classic. To power and successful casino, you need an extensive range of top performing content as well as a smart management tool. This is where NetEnt, a world leader in providing premium gaming solutions comes in. A true pioneer in driving the competitive market with thrilling games, NetEnt take pride in delivering flexible digital casino solutions. You can learn more about NetEnt's range of online slots games on Easy Slots mobile casino here. You can always just play for the chance to get no deposit spins. Yea, groovy baby! Psychedelic shack and all that great stuff from the vibrant, happening sixties! Ever heard your parents say, ‘They just don't make music like that anymore,' and wondered what on earth they were on about, time to travel back in time several decades with this blazin', retro slot from NetEnt. You will get a flavour of a bygone era, when The Beatles were performing for pennies and Cilla Black was hanging up their jackets. It's fabulous. Ready to rock around the slot? Set those bets, low as 0.40 to the max 2.00 and let's go baby! 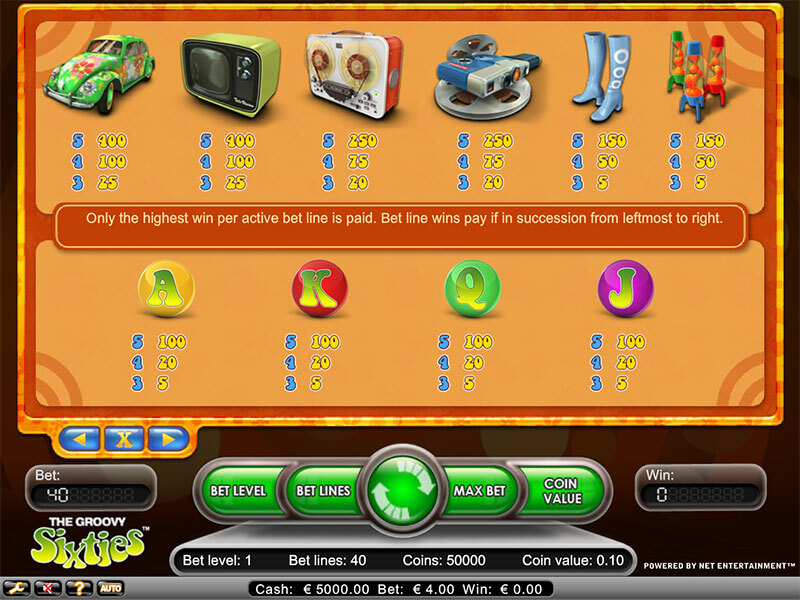 You can learn more about their range of games here at easyslots.com. We have a decent 40 playable bet lines and five colourful reels spinning on a white background that allows the symbols to shine. The symbols are gorgeous. Well rendered and the orange and yellow colour scheme just screams sixties! There is also a cracking sixties inspired sound track that underscores play and really livens up the theme. The symbols decorating the reels are all theme inspired and we have playing card values Jack to an Ace these symbols are inside colourful bubbles and are the lower payouts. Next the medium payouts include a flower decal covered Beetle car, a TV, a pair of knee-high boots, A reel to reel tape recorder, old style film reels and a set of lava lamps (don't scoff, you love em!) Here watch for the Beetle - a line of five will net you 400 coins. The TV has the same payout table too, so both symbols here are quite lucrative. The 60’s logo is the game’s wild. The wild swaps out for all other symbols, except the scatter. Multiple wilds on each reel line up to create Stacked wilds. Three wilds will net you fifty coins, four wilds will win you two hundred and land five wilds and your win is a massive one thousand coins! The scatter is a smiling girl and it’s this symbol that triggers the Free Spins feature. Get three scatters and you win a total of five free spins and your win is multiplied x2. During free spins play, get a further three scatters and the win process is repeated, your total is multiplied (x2) and you win a further five spins! Within the neatly designed panel beneath the reels, we have the main spin button and spreading out either side of that buttons allow settings for your bet level and bet lines. On the other side (right)there is a Maximum bet button and coin value. Beneath this a hand information bar keeping you informed of your bet level, bet line, coins and your coin value. Beneath this is another information bar showing you your money bets and wins. Click on the spanner and you can mute the sound effects and music - but really, why would you? Click on the Auto button and a handy panel flips open allowing you to set up auto spins to suit. Who doesn't love a nostalgic trip back in time, especially to a time like the sixties? If you have a hankering for a trip down memory lane, or you're a fan of the past, then Retro Groovy 60's is definitely worth looking out for. 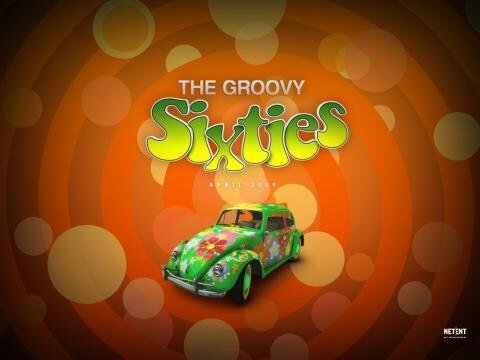 Retro Groovy 60’s a nostalgic trip back in time to one of the most popular and explosive decades in British history. Well designed and true to it’s theme, this kind of slot will attract those that experienced this time and those who wish they had. It plays smoothly, has a reasonable bet scale for newbies, low rollers and the experienced. Easy to play, great to look at, this slot is groovy! 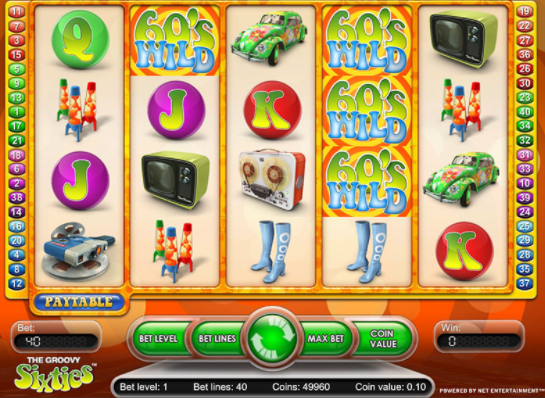 If you enjoyed Retro Groovy 60's you might also like Gonzo's Quest online slot, view more!